Dorothee Pesch (born 3 June 1964, Düsseldorf, Germany), popularly known as Doro Pesch or Doro, is a German hard rock vocalist and songwriter, formerly front-woman of the heavy metal band Warlock. 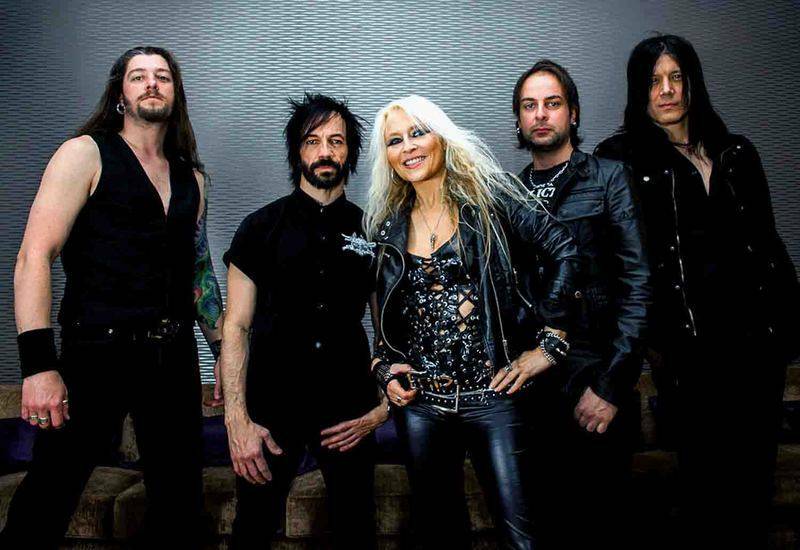 The name Doro has also been associated with the touring band accompanying the singer, whose members have continuously changed in more than twenty years of uninterrupted activity, the most stable presences guaranteed by bassist Nick Douglas and drummer Johnny Dee.Doro started her career in garage bands in native Düsseldorf underground scene and achieved media visibility and some commercial success with Warlock in the 1980s. Warlock were starting to have an opening in the US market, when they went through many line-up changes and Pesch was left the only original member of the band. She started a solo career under the name Doro, in order to avoid legal battles between her record label PolyGram and her former manager. She released two albums in the US with producers Joey Balin and Gene Simmons, but they were not the breakthrough that she hoped.During the rise of grunge and alternative rock in the 1990s, her record label relegated her productions only to the European region, where she continued to tour extensively. She remained a successful charting artist in Germany, despite living and producing her albums in the US. When classic heavy metal found again the favour of the public, she returned to tour all over the world and her popularity as a veteran singer grew considerably, inspiring many new female metal artists. Doro is also known for her duets performed both live and in studio with other singers and musicians of the metal scene, whom she has befriended in her long career.To this date, she has released sixteen studio albums, the latest being Raise Your Fist in 2012. Doro continues her recording career and is prolific touring artist all over the world. When not on tour, she resides in New York City.In June 2013, the music magazine Metal Hammer assigned Doro the Golden God Legend award. 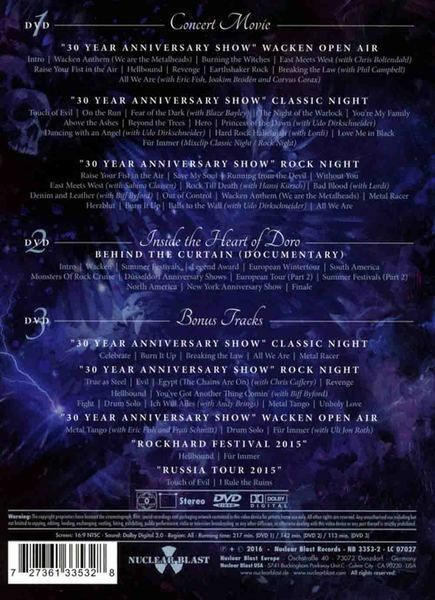 Three decades of Doro — three unforgettable nights — forever captured on video; including an two-hour-plus great music movie, which delivers deep insights behind the scenes and inside the heart of Doro.Nuclear Blast release this incredible Doro anniversary package, entitled 'Strong And Proud: 30 Years Of Rock And Metal.' It is a fantastic memory for everyone who has seen Doro live worldwide during her anniversary and a revelation for all fans of good, hard rock music and classy live performance with blood, sweat and tears.Says Doro: "We spent endless hours, days and nights working on the DVD, because we wanted to present a real highlight for all rock and metal fans for the 30th anniversary. We took care of every detail. It began already with the bombastic stage in Wacken, we worked one year on its design. In Dusseldorf, we even celebrated two nights in a row. One 'Classic Night' with a 40-piece orchestra and one 'balls to the wall' rock show on the second evening. It continued subsequently nonstop — with an anniversary tour, with led us to Russia, South America and my second home, the USA, among others. "'Strong And Proud: 30 Years Of Rock And Metal' contains 38 songs in total, a full load of rock and metal, including all Doro classics, many old Warlock hits and ingenious cover versions of songs such as "Fear Of The Dark" (Iron Maiden) and "Balls To The Wall" (Accept). The filming and cutting is phenomenal, and the sound crystal-clear. Once again, the packaging was drawn by Doro's favourite artist, Geoffrey Gillespie.Additionally, 'Strong And Proud: 30 Years Of Rock And Metal' offers a unique music movie with a two-hour plus documentary, "Behind The Curtain, Inside The Heart Of Doro. "It gives the spectator deep and detailed insights into the world of Doro!